She decided on a vintage feel so chose a sepia filter and then added some lovely stickers (there are loads to choose from). She didn't want to go overboard though so she simply added a few flowers and a neat little frame. I think it's rather sweet and I'm sure Granny will love it. Happy birthday to your granny! I like the sepia effect with the frame. Happy Birthday to your Granny. Happy birthday to your granny, Athena! Your card for her is so beautiful. She will love it for sure. Happy Birthday to your Granny, we just know she is going to LOVE the lovely card you made. Happy Birthday to your Granny, I'm sure she will love it! 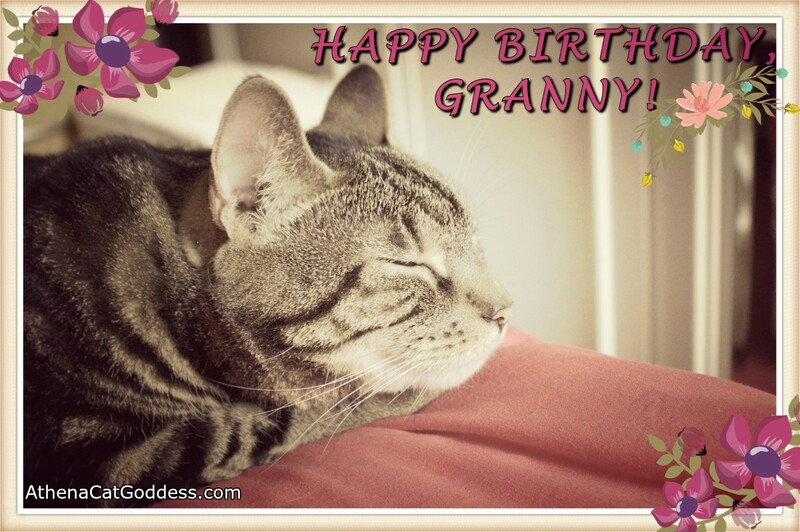 We wish your Granny a very happy birthday Athena! What a beautiful card, Athena and Mum. Happy birthday to Granny! Happy Birthday to Granny! The card is lovely. I am sure she will live it. Your card for your Granny is magnificent! Thank you :) She does love it. Thank you. I gave her extra purrs and she stroked me and told me I'm a very beautiful cat but she still won't let me sit on her lap. Thank you. No, she just has this fear of animals sitting on her lap. I think she's scared of my claws.